Collagen injections are nonsurgical cosmetic procedures used to reduce the appearance of fine lines and wrinkles. Collagen injections are most frequently used to treat frown lines, crow’s feet, laugh lines, and smile lines. It is also used to add fullness or definition to the lips. Collagen injections provide immediate results. They may be used in conjunction with other cosmetic procedures, such as BOTOX injections or a facelift. Collagen is a natural protein. It is available in different thicknesses to meet individualized needs (deeper folds vs. superficial lines). Collagen is placed beneath a wrinkle or in the lips to make the skin appear more plump or full. Your body will absorb the collagen over a few months. Treatments are commonly repeated every three or four months to maintain a healthy youthful appearance. 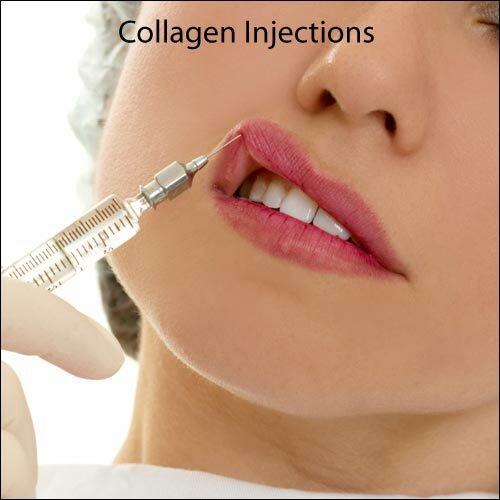 Collagen injections are outpatient procedures that you can receive in your doctor’s office. The injection solution contains a combination of collagen mixed with local anesthesia. Collagen injections are a very short procedure. The injections can take less than one half hour to administer and are considered a “lunch hour” treatment. You can receive your first treatment about a month after you have a simple skin test (which makes sure that you are not allergic to the collagen solution). For the procedure, your doctor will place a tiny needle under your wrinkle and into your own collagen. Several injections may be needed depending on the depth and location of the wrinkle. Some people may need multiple treatments over the period of a few months to achieve their optimal result. Collagen injections may initially cause temporary minor discomfort and redness. You may resume your regular activities immediately. Collagen treatments typically need to be repeated every three to four months, depending upon the individual and area of treatment.